Today our luck avoiding the rain officially ran out. Consistently rainy and windy conditions accompanied us for our teams’ morning training sessions and games, but true to form, the weather did not damper spirits or the will to compete. After breakfast, our ‘02’s trained outdoors. Meanwhile, our 2003 and 2004 teams met in the locker room to change and prepare for the upcoming games. 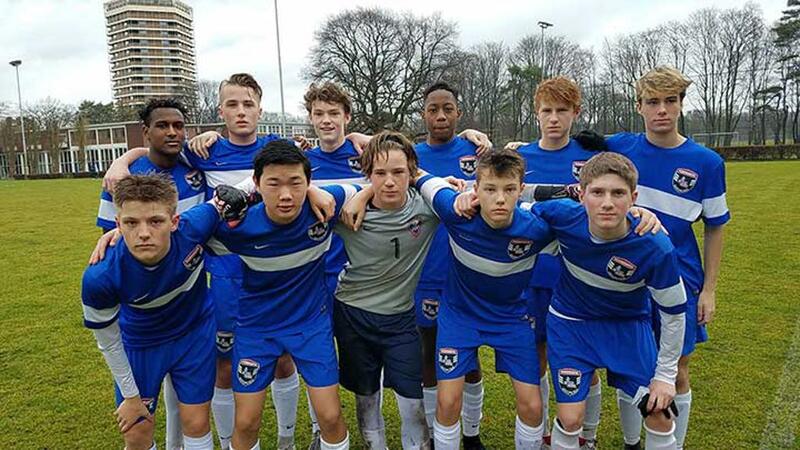 Our 2004 team played a team sent to Wedau by RSV Ratingen. The matchup was even, and both teams had an equal number of chances to score. Our team played well, and the coaches were very happy with the overall performance. Our 2003 team also played an RSV Ratingen team. Our ’03 team came out strong and put a lot of pressure on RSV and dominated offensively. RSV responded by making adjustments to their offense, creating a couple good chances for themselves which resulted in a more balanced match, but overall, Minnesota still had the edge with ball possession in the attacking end of the field. Our ’03 and ’04 players were excited to present MYSA pins to the opposing teams’ players after the game. Like our 2002 team did yesterday, our ’03 and ’04 each chose an MVP from their opponents’ team and presented him with a MYSA scarf. Watching this unfold, made those of us on the sidelines very proud of our boys, how they conducted themselves, their sportsmanship, good will and overall enthusiasm. Our opponents once again walked away impressed. All three of our teams have now officially logged their first games and we are excited to see how they will each progress and develop over the course of the week. 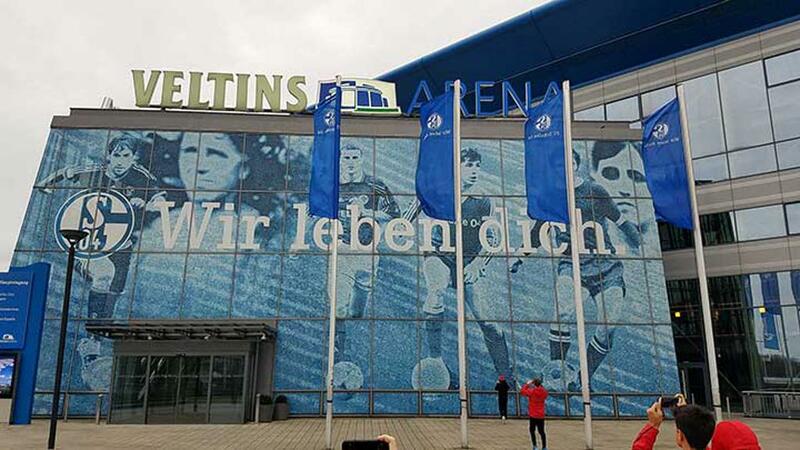 All of our players met for lunch in the cafeteria before we departed for a stadium tour of Schalke 04’s Veltins Arena. 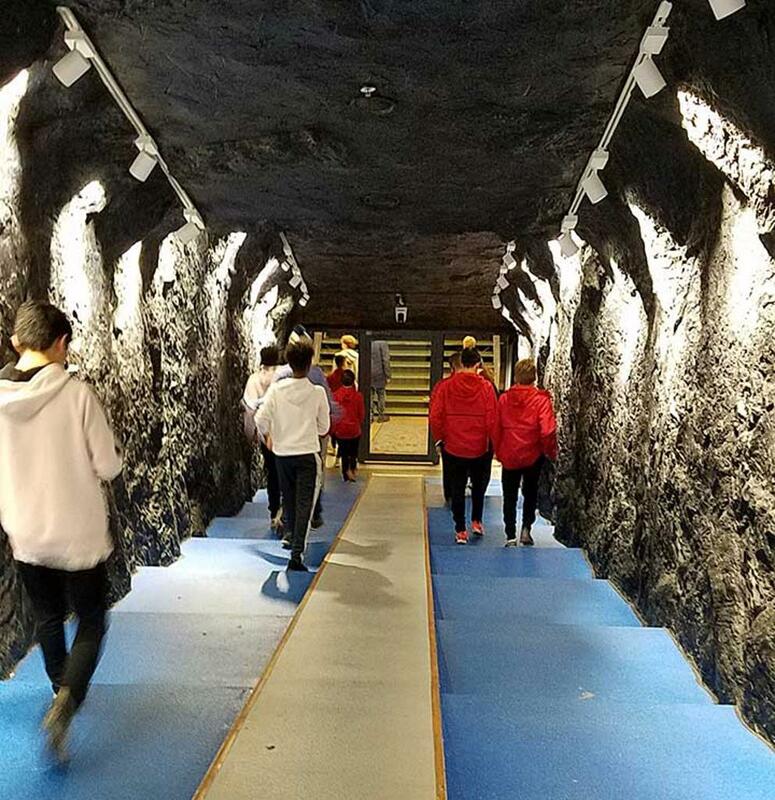 The boys were excited to tour the museum, touch the field, walk through the players’ tunnel. see the players’ locker room and ask any question that came to mind as each team was given a personal tour by a very knowledgeable, English-speaking tour guide. We learned that the stadium holds 62,271 at capacity, the live pitch is mobile and rolls out to make the field space multipurpose for events like concerts as well as other sports such as the biathlon and ice hockey. Because the field rolls out, they aren’t risking damage to the pitch. The team is co-owned by 155,000 paying and passionate fans, making it the second biggest sports club in Germany and the fourth largest fan base of any team in the world. The club is committed to celebrating the strong, working class, coal miner history of its fan base and elements throughout the stadium give clear signals to that, including the players tunnel designed to look like an old coal mining shaft. 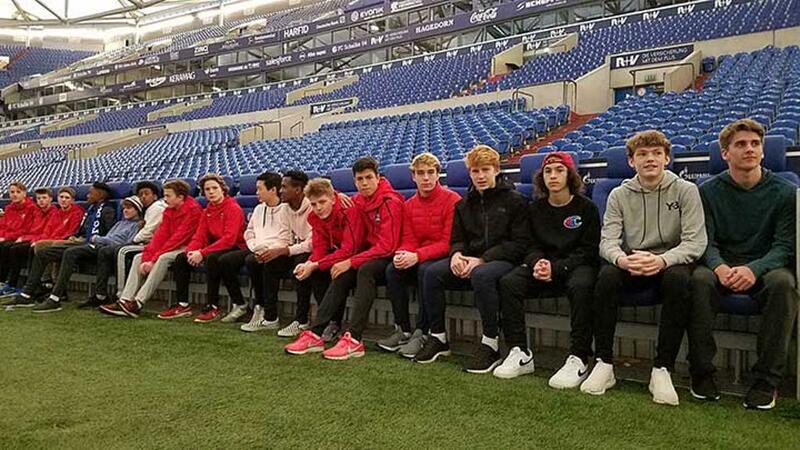 Here are some interesting questions that the kids asked: “Why is the locker room messy?” “How long does it take to get a season ticket in the “Supporters Club” section?” “Can I stand on the field?” Be sure to ask your player about this experience, as we were impressed with their curiosity and wonder. It will be fun for you to hear about this tour from their perspective. After the tour, we returned to Wedau for dinner. Our teams met with coaches afterwards and had 90 minutes of free time to enjoy before lights out at 10:00 p.m. It was another busy and productive day in Germany.